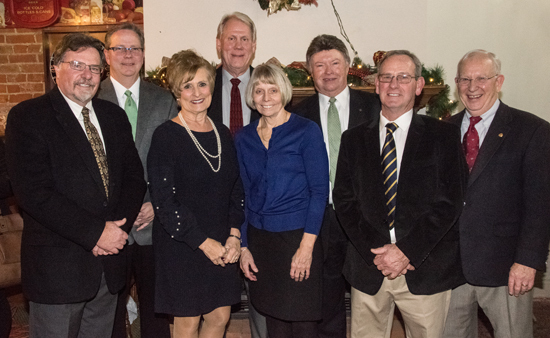 DELPHOS — The Arnold C. Dienstberger Foundation distributed a record $325,000 in grants to Delphos area non-profit organizations during its annual event held at The Delphos Club on Tuesday. The foundation was created in 1966 using funds from the sale of nursing homes owned by Dienstberger in the Delphos area to Vancrest Health Care Centers, while other bequests to the foundation have been made over the ensuing five decades. Foundation Trustee and event emcee Rick Miller noted during his welcome that, over the past two decades, the foundation has distributed more than $5.5 million to area organizations. As he does every year, Miller also thanked the non-profits for their impact on the community and the work they do, noting that it’s the various non-profit community organizations that make a difference in the lives of Delphos residents. “You are doing what you do, and we appreciate that, the community appreciates it,” Miller said. Following Miller’s welcome, Foundation President John Nomina, Vice President Bill Massa, Treasurer Doug Harter, Secretary Jerry Gilden, and Trustees Doris Neumeier, Loni Miller, and Nick Clark handed out envelopes to representatives of each organization, who then talked briefly about how the money would be used. This year, as in most years, Delphos schools received the largest amounts, with Delphos City Schools and St. John’s Schools each receiving $50,000. Representatives of both school districts noted that money from the donations would be used for technology purchases, while St. John’s Principal Adam Lee added that some of the donation to that school would go for professional development and other educational projects. Three organizations, Delphos Chamber of Commerce, Delphos Canal Days, and the Delphian Social Club received the next highest amount, $41,500, to make improvements to a building they purchased in downtown Delphos. The Delphos Stadium Club and Delphos Kiwanis Club each received $40,000 to help fund construction of a new pool house for the Delphos Municipal Swimming Pool in Stadium Park. Allen County DARE, $2,500 — To be used for awards, DARE operations in Delphos schools, and the annual DARE summer camp in Delphos. Delphos Veterans Council, $2,500 — To be used to install new lighting at the Veterans Memorial in Delphos. Delphos Jefferson and St. John’s athletic boosters, $2,500 apiece — To be used for upkeep of the community track complex at Delphos Jefferson. Delphos Canal Commission, $5,000 — To be used for an exhibit on famed Delphos astronomer Leslie Peltier at the Canal Museum. Delphos Area Chamber of Commerce, $2,500 — To be used for new Christmas decorations for the downtown area. Delphos Community Christmas Project, $15,000 — To be used to purchase Christmas gifts for needy local children. Community Health Professionals, $6,000 — To be used for CHP’s Patient Care Fund to provide items such as medications and equipment for those without insurance or who are underinsured. Delphos Boy Scouts and Cub Scouts, $500 each — To be used for a trailer, summer camp, awards, and other items. Delphos Girl Scouts, $500 (no one attended to receive the grant). Delphos Habitat for Humanity, $2,000 — To be used to either help build the group’s 10th house in Delphos, or for a fund to repair homes of Delphos senior citizens. Delphos Police Department, $5,000 — To be used for a computerized evidence management system for the detective bureau. Delphos Fire and Rescue, $5,000 (representative was called away prior to the distribution). Delphos Museum of Postal History, $5,000 — To be used for enhancing existing exhibits and to create new exhibits. Delphos Public Library, $7,500 — To be used to upgrade computers used by the public at the library. Delphos Rotary Club, $12,000 — To be used for the club’s Music in the Park Series held each summer in Stadium Park. Delphos Senior Citizens Inc., $15,000 — To be used for an awning over an entrance area, a sound system for the activity rooms, and for outreach programs. St. Vincent de Paul Society, $7,500 — To be used for cash assistance for rent, utilities, and medications, as well as to purchase food for the organization’s food pantry, if needed. Delphos Baseball and Softball Association, $2,500 — To be used for new nets in the batting cages, nets for outside the cages, and a concrete pad for the Pony League teams.